We recently tested all the rooting gels, liquids and powders we could get our hands on and Elite 91 Clones came out top. Rooting all clones with an average of 3 days less time taken, all remained healthy and continued growth without need for recovery. Elite 91 Clones Professional Liquid Rooting Compound is a combination of two powerful root-inducing hormones, making it the number one choice for professional plant propagators. We recently tested all the rooting gels, liquids and powders we could get our hands on and Elite 91 Clones came out top. Rooting all clones with an average of 3 days less time taken, all remained healthy and continued growth without need for recovery. Elite 91 Clones Professional Liquid Rooting Compound is a combination of two powerful root-inducing hormones, making it the number one choice for professional plant propagators. A simple 5-second dip in the Elite 91 Clones rooting compound is all it takes to initiate the formation of strong, healthy roots. Clones is formulated as a liquid for a more equal distribution and absorption of the root-inducing hormones, as opposed to gels or powders. The hormones from Elite 91 Clones are absorbed directly into the cutting's plant tissue, immediately triggering a rapid development of vigorous, white roots. 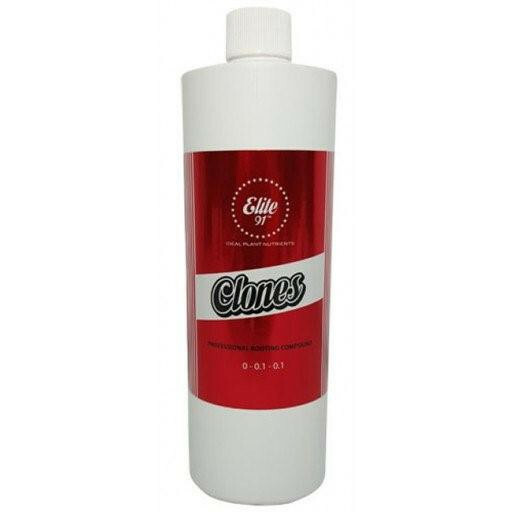 The liquid from Clones Professional Liquid Rooting Compound by Elite 91 will not rinse, wash, or wipe away, ensuring optimal root success every time. Unlike rooting gels or powders, which can result in inconsistent delivery of the rooting hormone, Elite 91 Clones liquid rooting compound is absorbed evenly. Elite 91 Clones has been extensively tested by both professional and novice growers and has shown to root any type of plant, regardless of strain, phenotype, herbaceous softwood and hardwood cuttings. Elite 91 Clones produces consistently superior results for successfully cloning hard-to-root genetics time and time again, its also easy and ready to use straight from the bottle, no dilution necessary. •	Combination of root hormones for successful plant propagation. •	Comes ready to use, no dilution necessary. •	Roots any type of plant regardless of strain, phenotype, softwood, hardwood or hard-to-root genetics. •	90 to 100% overall success rate when directions are followed. •	Rooting compound will not rinse, wipe, or wash off the cutting's stem. •	Promotes root development for softwood and hardwood plant cuttings. •	Increases cell and tissue growth for root formation. •	Ideal for all growing methods, including, but not limited to, Rockwool, Oasis Wedges, Starter Plugs, Soil, Soilless, Coco, and Aeroponics. 1. No dilution necessary. Pour a small amount of Elite 91 Clones liquid rooting solution into a small, clean container. 2. Using a sanitized scalpel, razor, or scissors, take a cutting from a healthy, disease-free mother plant directly beneath the node at a 45 degree angle. Remove large leaves or cut them in half to prevent water loss through transpiration in order to prevent wilting. (Optional: VERY gently scrape or shave off the epidermal layer of the cutting's stem about 1 inch in height all the way around. This method is designed to trigger and focus the cutting's response to form roots along the base). 3. Immediately submerge the cutting's stem into the rotting solution to the optimal rooting depth for at least 5 seconds. Optimally, 0.5 to 1 inches in height from the base for 5 to 20 seconds for softwood plants, and 10 to 30 seconds for hardwood plants. 4. Insert cutting into a moist, preferred choice of growing medium. Optimally, use a plant propagation kit with a clear humidity dome that maintains an ideal environment of temperature and humidity. Follow the same directions as above, except do not discard the used portion of solution after plant propagation is complete. Save it and store it in a separate light-protected resealable bottle for subsequent applications. For every round of plant propagation, add a small amount of new Elite 91 Clones to the mixture of reused solution. Once the bottle is empty, simply use the remaining solution until there is no more.